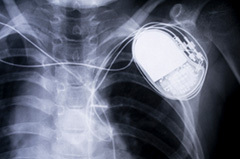 What Are Pacemakers & Defibrillators? Pacemakers and defibrillators are small devices implanted into the body to help regulate the heart through electrical signals. Cardiothoracic surgeons implant these devices to keep the heart beating in a normal rhythm. Specialists at University of Utah Health have over twenty years’ experience in these procedures. They constantly participate in research to bring the latest in cardiovascular treatments to their patients. 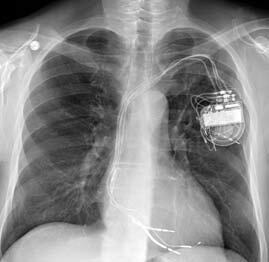 Wires, called leads, are attached to a pacemaker and deliver electrical energy to the heart. When one or more of these leads needs to be removed, the procedure is called a lead extraction. Removing lead wires from pacemakers and defibrillators is a delicate process. They don’t easily pull out. This is because they get tightly attached to the heart and veins through which they travel on the way to the heart. The longer leads have been implanted, the more tightly attached they get. Cardiologists use special tools and techniques to extract leads safely and effectively. Whether a patient needs lead extraction isn’t always clear-cut. University of Utah Health cardiologists can counsel patients on whether they need an extraction and if there are any alternative approaches. Learn more about our latest procedure with a leadless pacemaker.